Young's pub on the canal in Harlesden. The front of the pub is quite small but there's a large area at the back past the toilets photo, down some steps, and another along the side where the entrance from the car park is located. It also has a really large beer garden, which mostly overlooks the canal, and a canalside patio. There are even a few tables right down along the canal towpath. 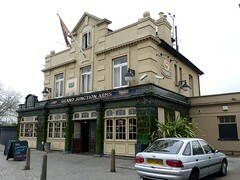 It has nine handpulls for ale, with three on each side of the large central bar. Young's ordinary (£1.30/half) and Wells' Bombardier are offered, as well as Deuchars IPA (£1.35/half) on an April 2009 visit. Other standard draught lagers are available, including Staropramen, Amstel and Heineken. According to an anonymous commenter (November 2009), they have a happy hour 5pm-6pm on weekdays where all draught drinks are £2.50/pint. The pub has three pool tables. It was very quiet at 4pm on a Thursday afternoon, but no doubt gets busier on a sunny weekend. According to their website as of April 2017, food is served noon-3pm and 5pm-9pm Mon-Thu, noon-9pm Fri-Sat, and noon-7pm Sun. Last visited by Ewan and Kake, April 2009. Opening hours taken from the Grand Junction Arms website, April 2017. Last edited 2017-04-14 09:32:19 (version 21; diff). List all versions. Page last edited 2017-04-14 09:32:19 (version 21).